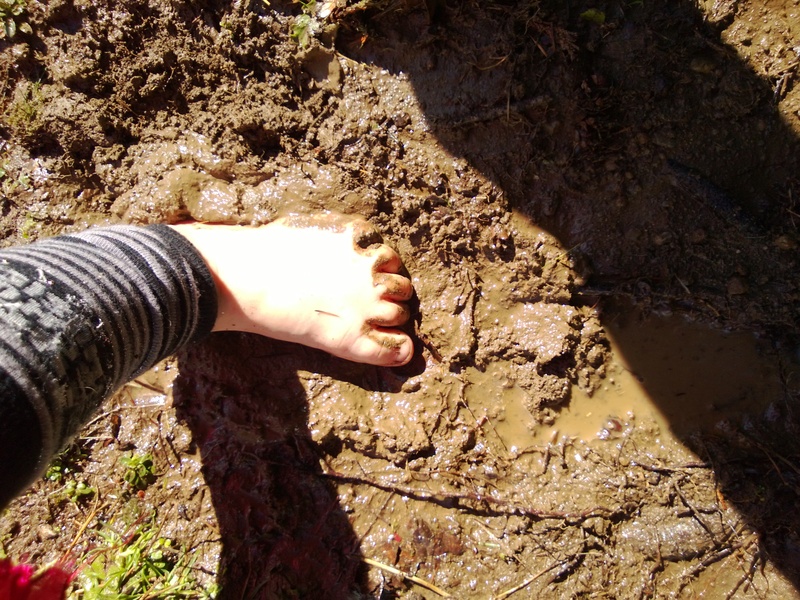 Outdoor Play: Making Muddy Footprints Isn’t Always Easy. I had a bit of alone time with my middle daughter. 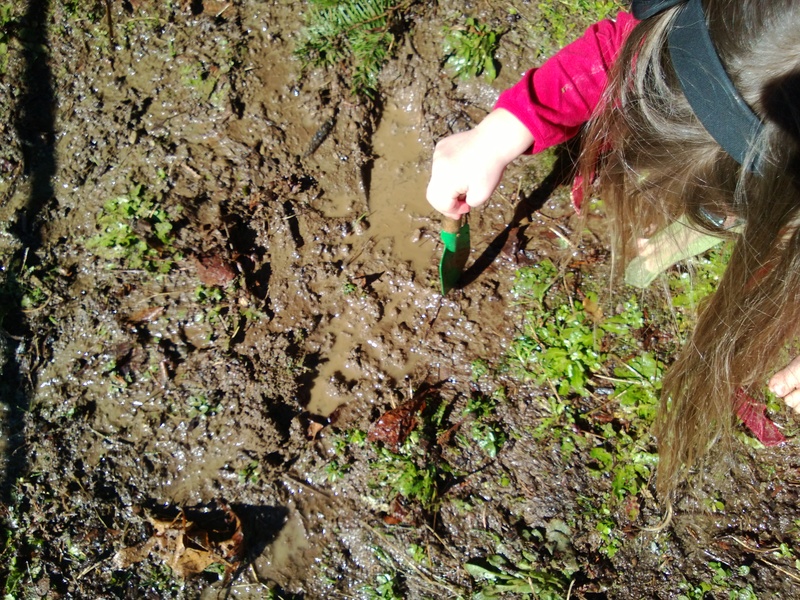 We thought it might be fun to try to make muddy footprints. 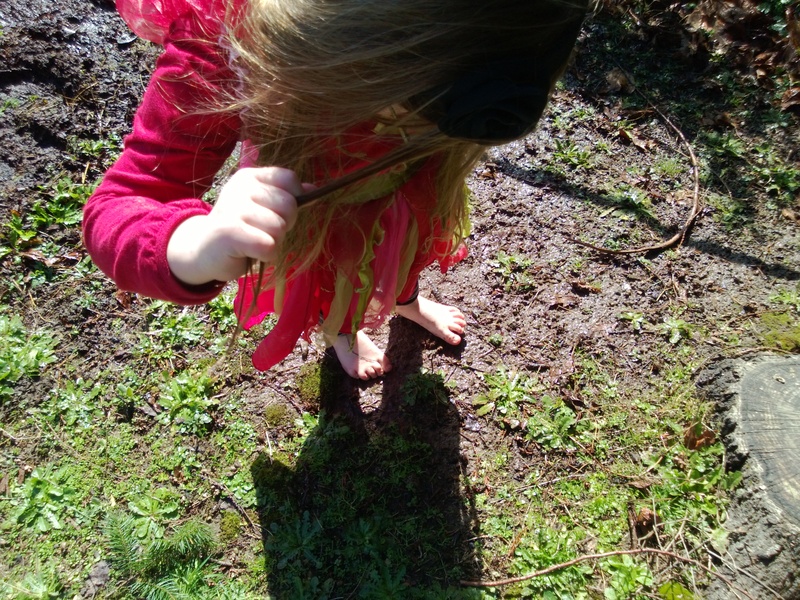 Do you want to make shoe prints or do it in bare feet. In Seattle it rains a lot. 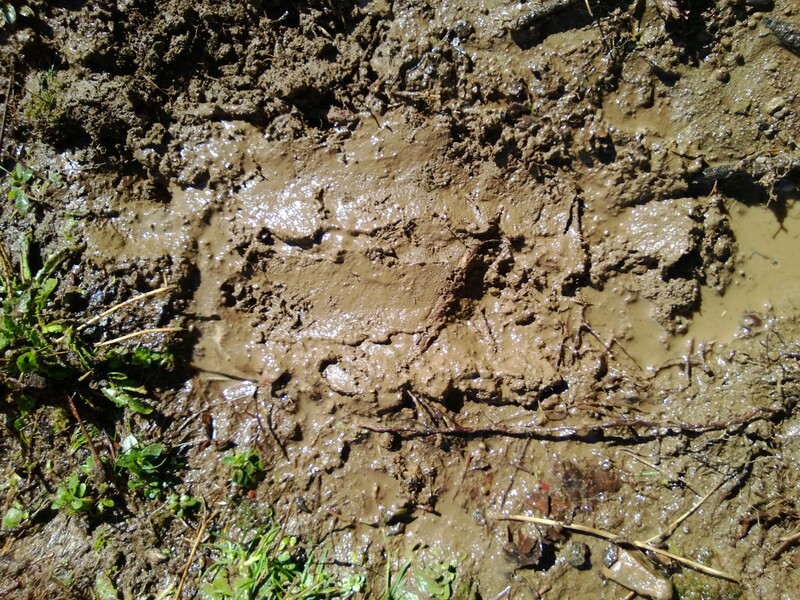 Finding soft mud shouldn’t be a problem…. But then it is still only just outside of winter and we still have frosty mornings. 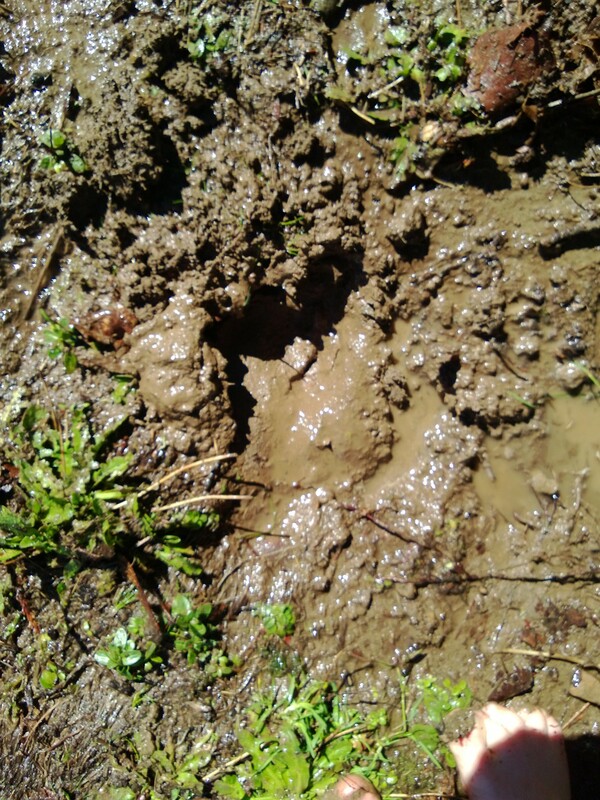 The mud didn’t look much like we would be able to make footprints. We decided to wet it with the hose. 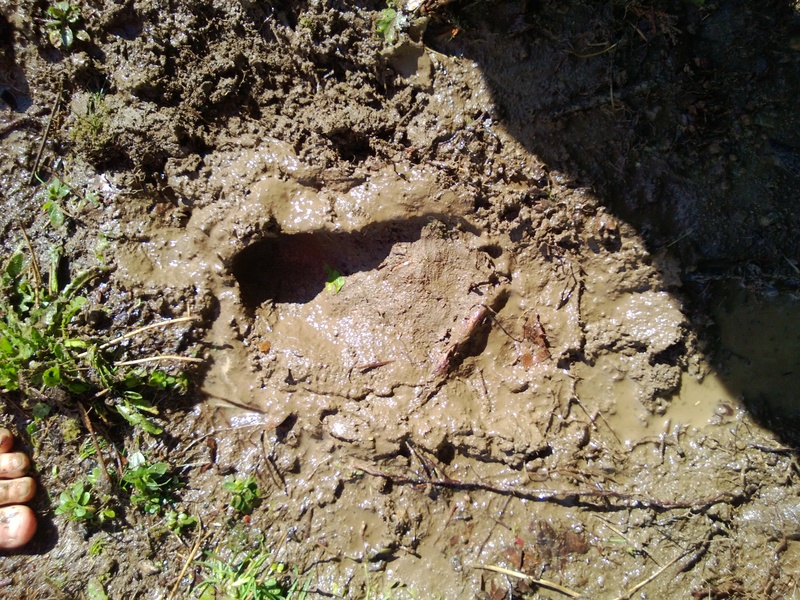 How about we dig a bit and try to find the clay-like mud? 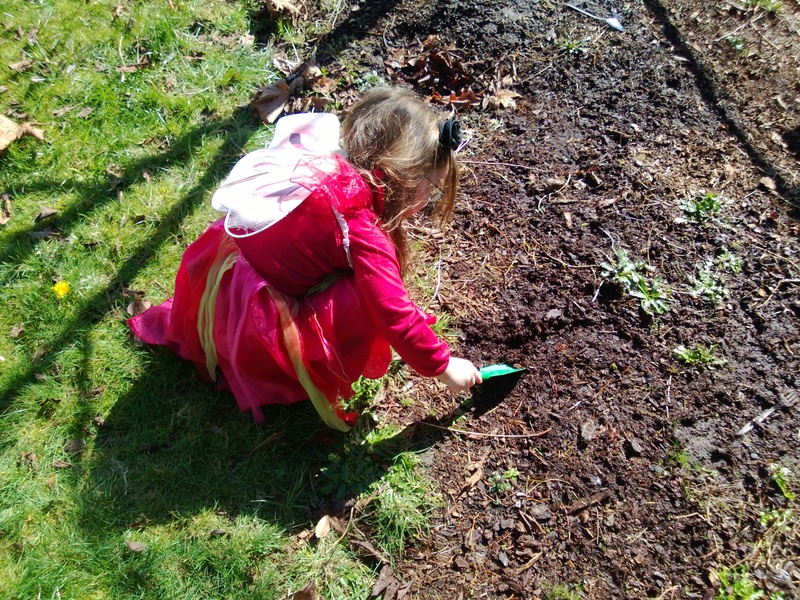 We found trowels and proceeded to dig. Let’s add a bit more water now. Now it’s too wet! It doesn’t work properly. How about we try to smooth it out and make it flat and then see what happens? We can try again in the Summer or in another bit of mud. 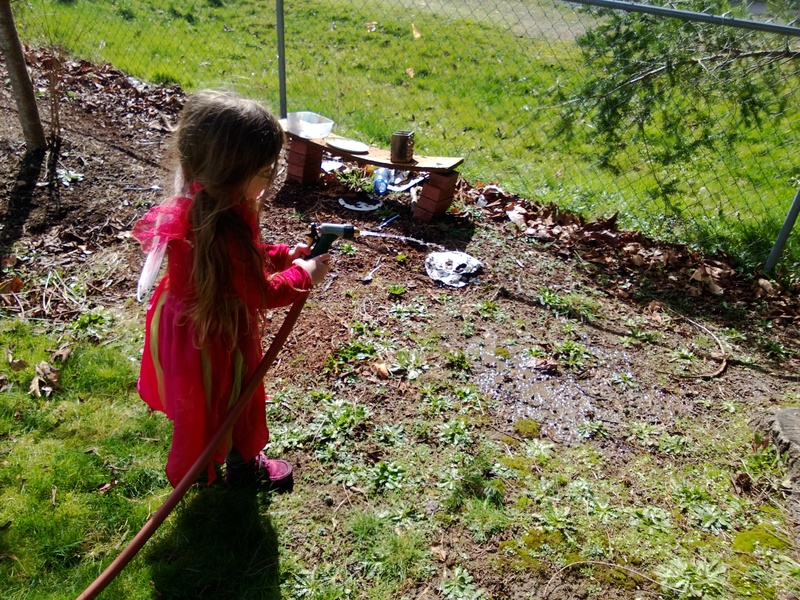 Can you wash my foot with the hose? 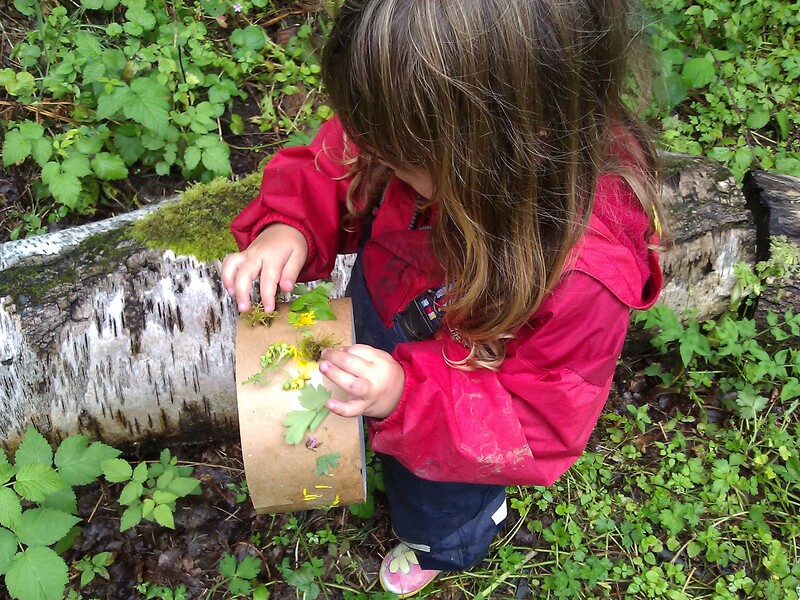 With limited toys and great weather,we have been playing with natural materials and everyday objects. 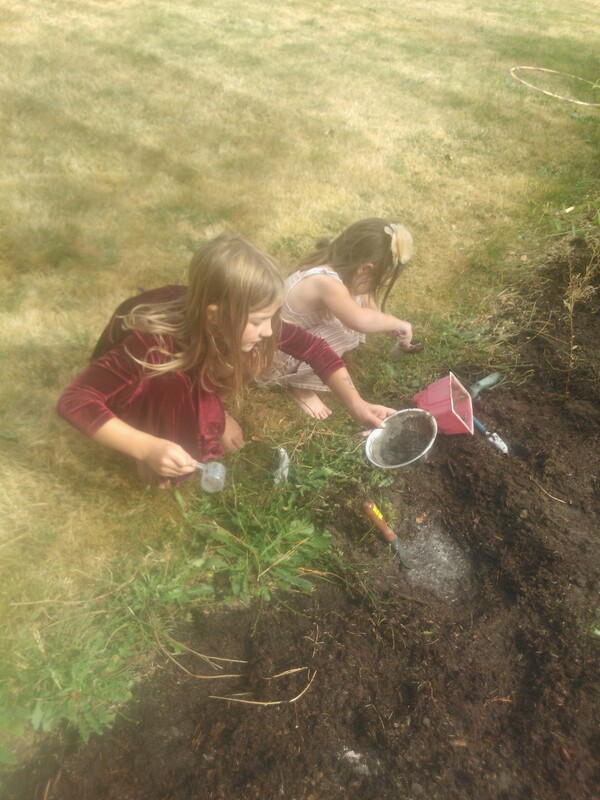 The children and I created a mud kitchen in the garden. 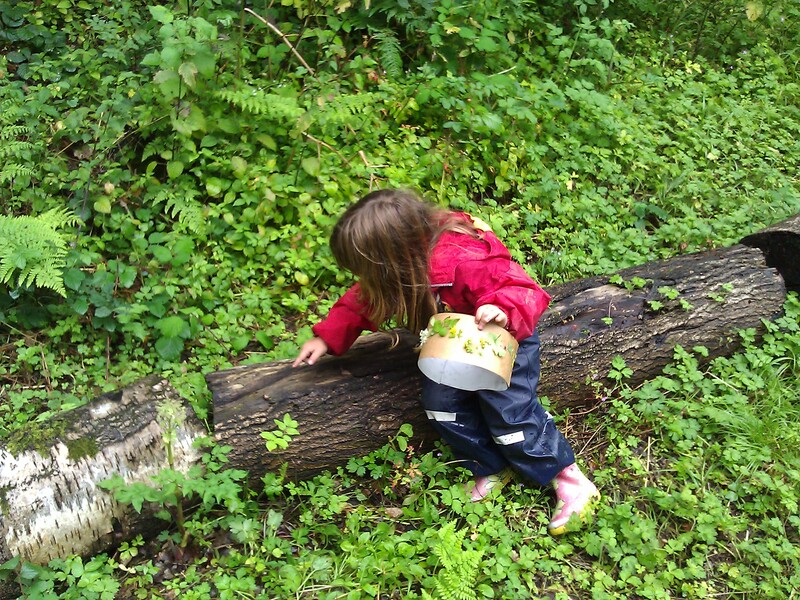 A mud kitchen is an outdoor play kitchen for children to explore the properties of mud. 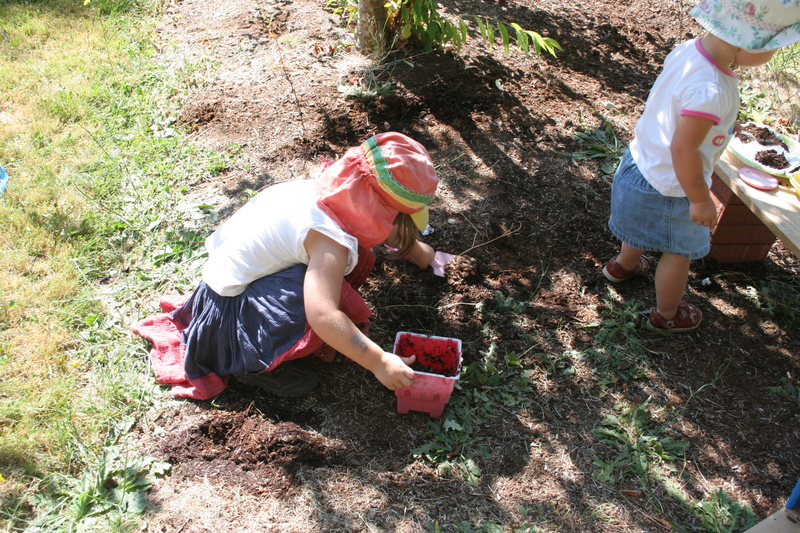 In a similar way to my own mud pie and mud drink making as a child, ( I remember filling up small dirt holes with water and tasting the mixture with a stick) the children mixed the mud in a kitchen made of recycled materials. You could use a ready-made play kitchen but it isn’t necessary. 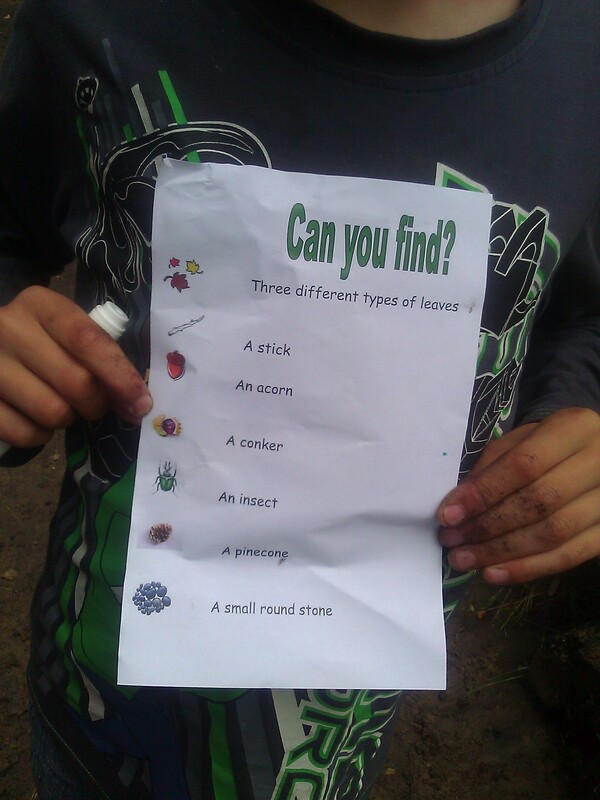 We made ours using various items we found around the house. We made a shelf using bricks and a piece of wood, an oven from a cardboard box and collected containers from our recycling. An old cupboard, table or sink would work equally well and I’m sure that when our stuff arrives from the UK we will find things to add. Collect old kitchen utensils, pans and bowls from charity shops, friends or car boot sales. We put a sign on our fence next to the mud kitchen requesting items – no-one has donated yet but the children check for new additions every day. It is a good idea to place the mud kitchen near a fence or tree where the utensils can be hung – this way the kitchen will be nicely self-contained and easy to tidy. 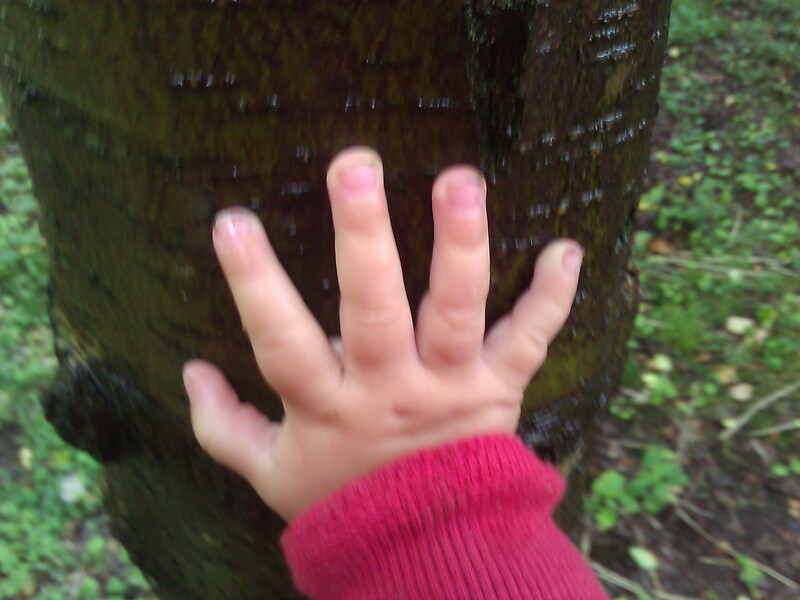 Children learn in a variety of ways; many children (particularly boys) prefer to play outdoors. 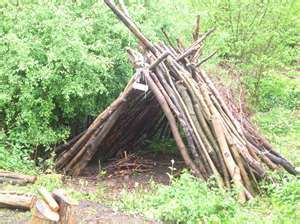 In most pre-schools I have visited in the UK indoor classrooms exist alongside outdoor classrooms. 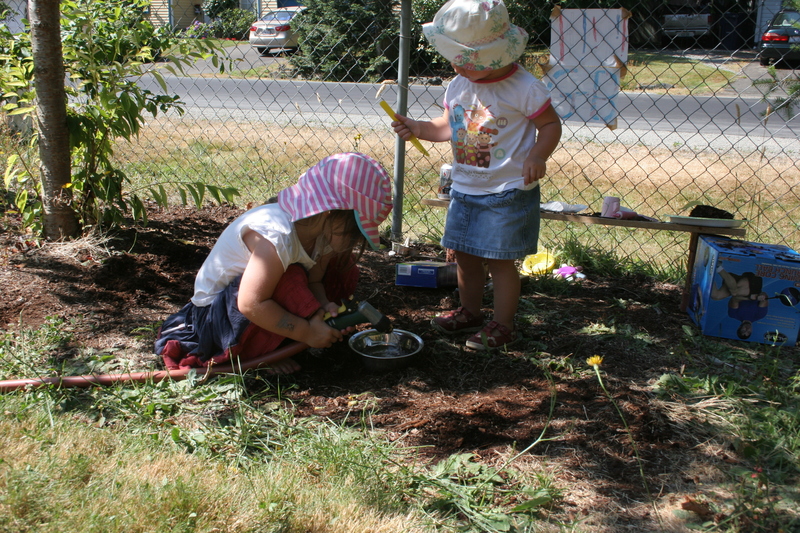 Children who may not choose imaginative play indoors may be attracted to the mud kitchen. The mud kitchen is rich in learning experiences including learning the rules of good hygiene, exploring the properties of mud, manipulating mud and tools with their fingers, measuring, imaginative play building on the children’s own experiences, finding out about bugs, problem solving and co-operation and sharing. 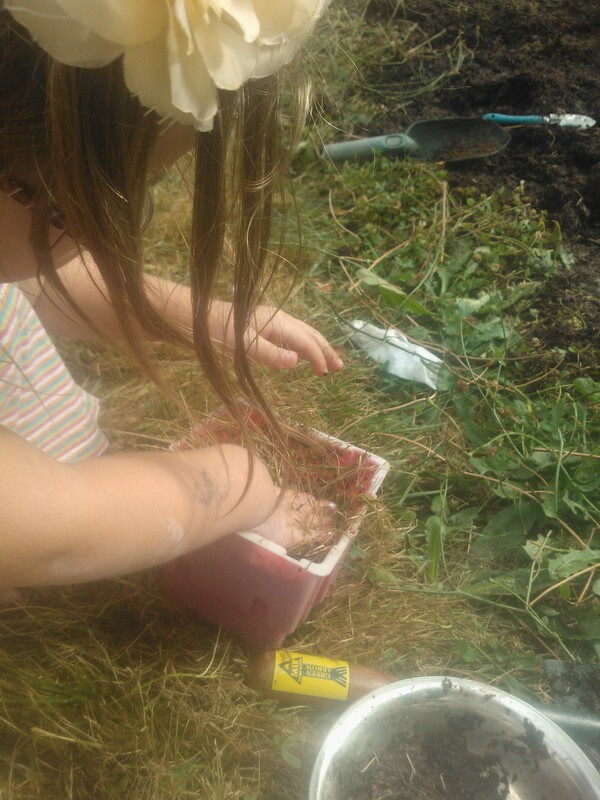 Involve the children in the creation of the mud kitchen, they will come up with many ideas that adults may not have considered. To add weight to my argument I read an excellent post this week about the health benefits of playing in mud. 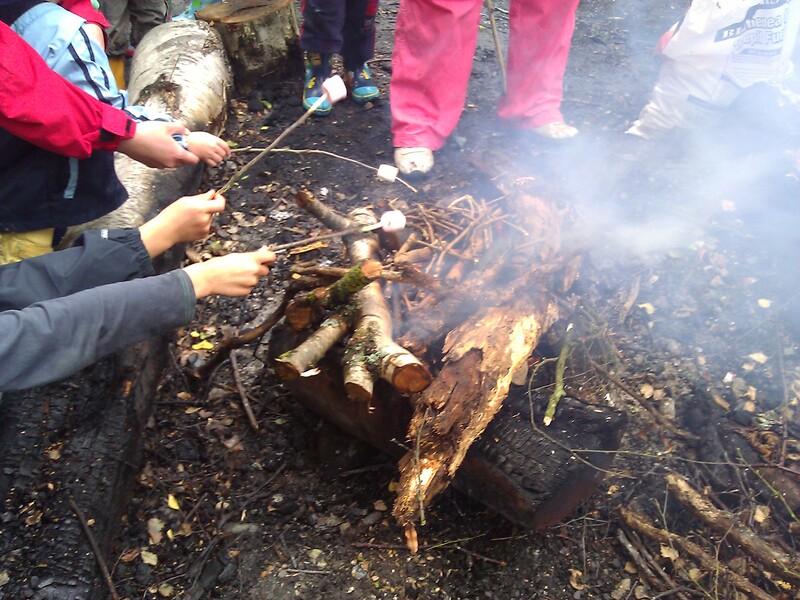 The Children of the 90’s project at the University of Bristol recently reported a number of benefits for children who spend time outdoors. 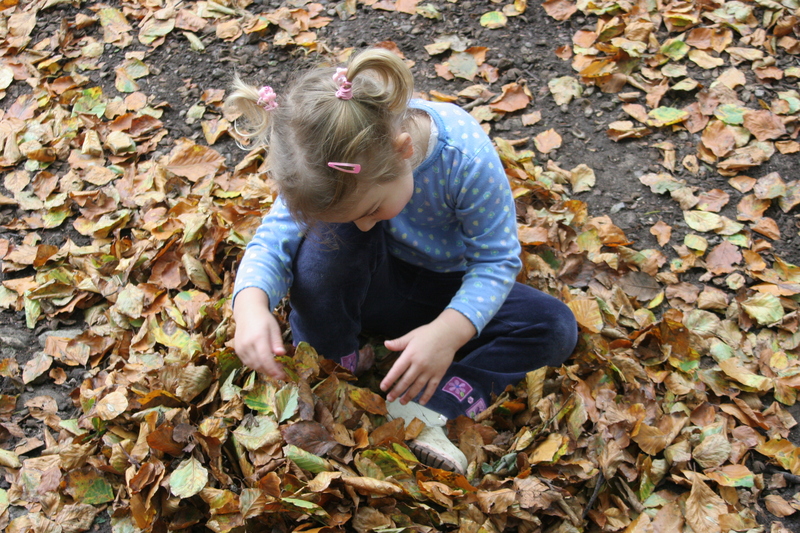 One study suggests that children who spend more time outdoors are less likely to develop short- sightedness and they also found that good levels of Vitamin D was linked to better health including mental health. Another study from Bristol University in 2007 suggests that friendly bacteria contained in soil, activates neurons responsible for producing the brain chemical serotonin. 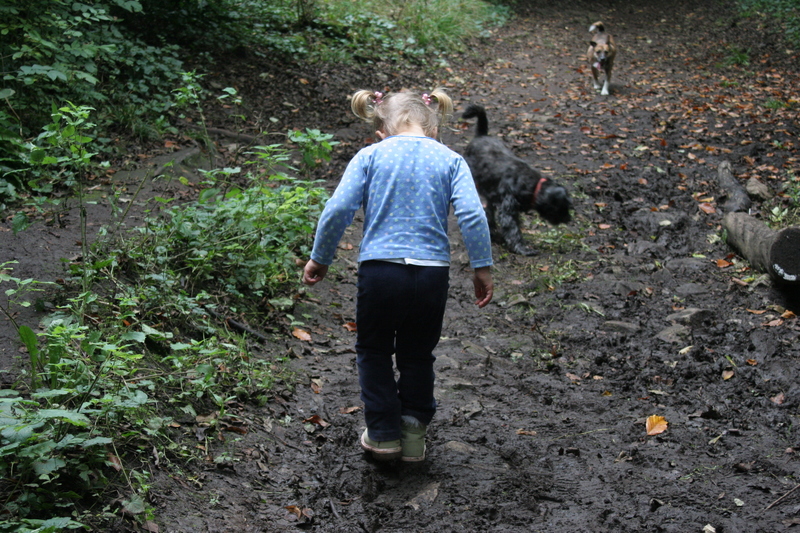 A lack of serotonin is thought to cause depression; playing with mud is therefore likely to improve children’s mental health. We built our mud kitchen during August. In the UK this is often the wettest month of the year but here in Washington State we have had a perfectly dry month. This was probably not the best time to build a mud kitchen but as the seasons change the play will develop. We built the kitchen in a patch of garden where there was plenty of soil but soon discovered that the top layer consisted of wood chippings from the surrounding Pine trees. This was great for sprinkling and pouring but moulding cakes and pies had limited success. 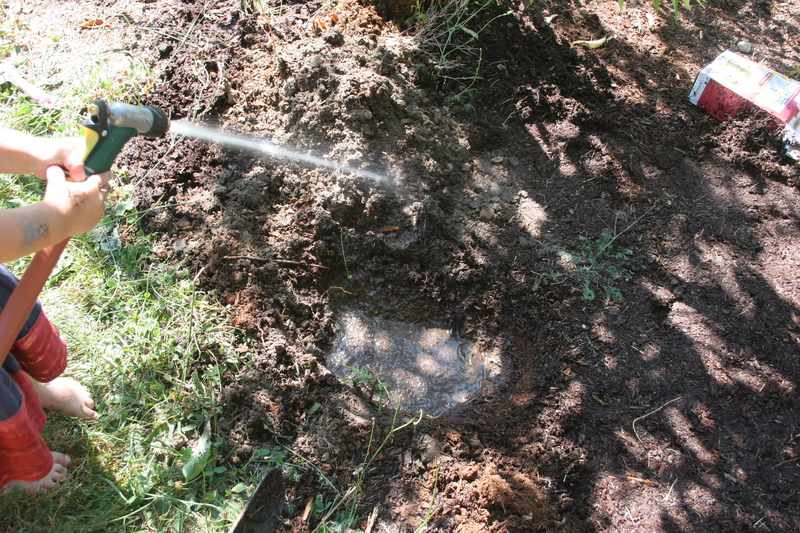 I suggested we dig a hole to reach the true soil under the surface, we used the hose to wet it. Filling the hole with water attracted a flying insect that we hadn’t encountered before, the girls were apprehensive but interested in watching the creature. 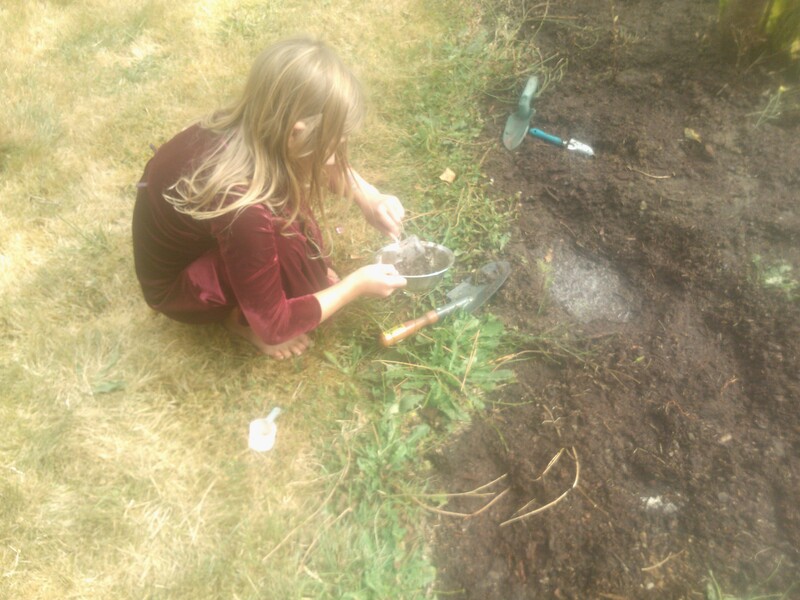 My 8-year-old who loves the idea of creating experiments or being an inventor, mixed the mud to make coffee. I suggested she put it into the empty coffee container but she explained that it started wet and took at least a day to drain off before it could be transferred to the coffee container. My 3-year-old preferred to make a cake. She sprinkled grass on the top. I’m looking forward to the change in the weather and seeing how the play develops as the mud changes.